The Salsa and Coleslaw in this recipe can be made ahead of time and stored in the fridge for even a few days, so all you have to do at dinner time is cook the fish, assemble and eat! Combine all Salsa ingredients in a bowl to combine. In a small bowl make the Coleslaw: Combine the greek yogurt, apple cider vinegar, honey and salt and pepper. Pour over cabbage mixture. Lay fish fillets out on a parchment paper lined baking sheet and sprinkle with 1/2 Tsp of Ancho Chili Pepper seasoning each. Cook according to directions (frozen) or fresh (approximately 12 minutes or until opaque and flakes apart easily). You can warm your Corn Tortillas in the oven or grill them on the bbq for a couple of minutes on each side while your fish is cooking (I find them best when grilled…it brings out the flavour). 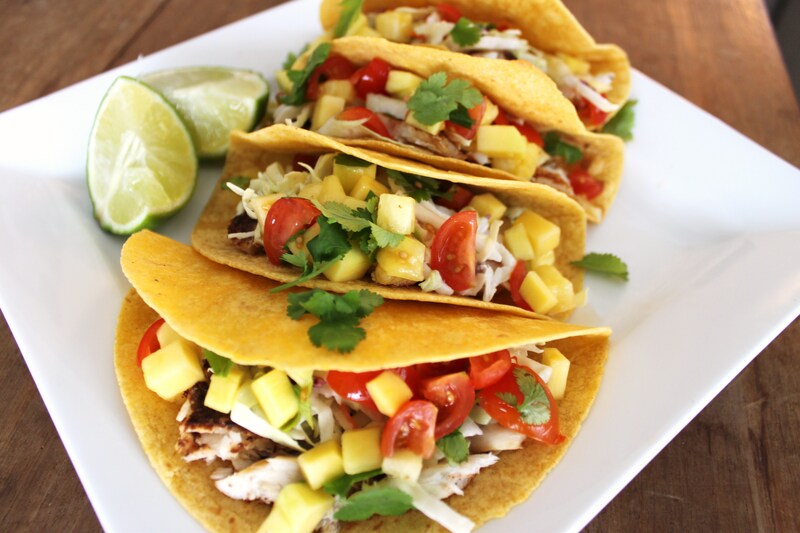 Assemble the flaked fish, salsa and coleslaw on your Corn Tortillas and Enjoy!